I read somewhere recently that kids fall into two categories when riding in the car: those who reliably sleep, and those who reliably snack (sadly, in lieu of sleep). My daughter has made it clear that she falls into the latter category, even on long car rides when you would think (hope) sleep would come so easily. It’s amazing to me how every year, all it takes is one snap of cool weather to shift me into autumn mode, and with that shift comes the urge to include apples, caramel, pumpkin, maple, or all of the above into so much of what we eat — snacks included. I love the idea of caramel apples but not how awkward they are to eat, and especially for my little eater’s mouth, I’ve been on the lookout for something with similar flavors that’s easier to manage. Enter this granola: with dried apples, crunchy almonds, and toasty oats all coated in a buttery caramel, it’s like a mashup of caramel apples and apple crisp! Completely addictive, definitely portable, and our newest entry into the car snack rotation. And breakfast, crumbled over yogurt. And to top vanilla ice cream, with some extra caramel sauce. And, if I’m being honest, handfuls-while-I-pass-the-jar, anytime. A candy thermometer is really helpful when making caramel, especially if (like me) you tend to underestimate how “done” the caramel is. I found the best results occurred when I slowly poured the caramel over the oat mixture while quickly and thoroughly stirring — this helps to avoid clumping. Finally, you may want to stir it a little bit when it comes out of the oven to minimize how much it sticks to the baking sheet. 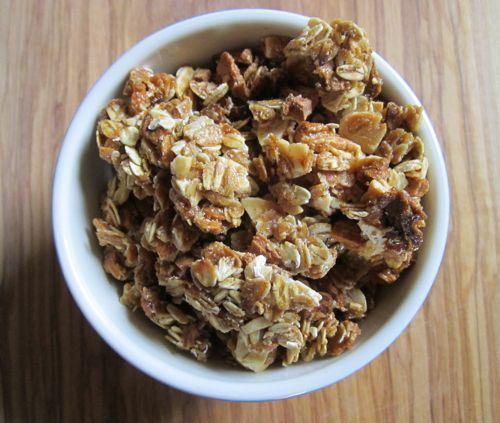 Mix together the oats, almonds, dried apples, spices and salt in a large mixing bowl; set aside. In a saucepan, stir together the water and sugar. 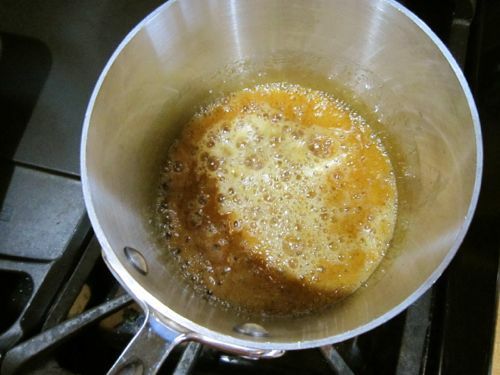 Bring to a boil and cook over medium heat (preferably using a candy thermometer to monitor temperature) until the syrup turns a golden amber color (this happened for me around 325 degrees F.) Be careful not to let the caramel get too dark, which will make it bitter. Remove from the heat and add the butter, swirling to melt. Slowly pour the caramel over the oat mixture, stirring quickly and thoroughly the entire time to minimize clumping and allow everything to get coated. 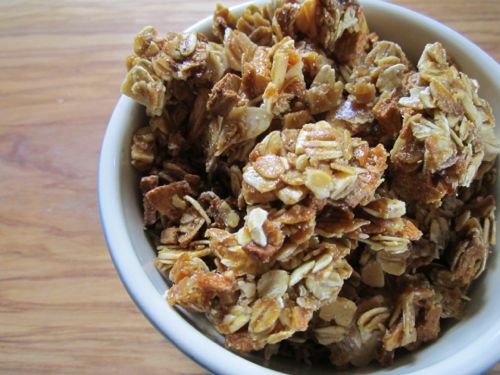 Spread granola on a baking pan and bake until golden brown and toasted, about 15-18 minutes. 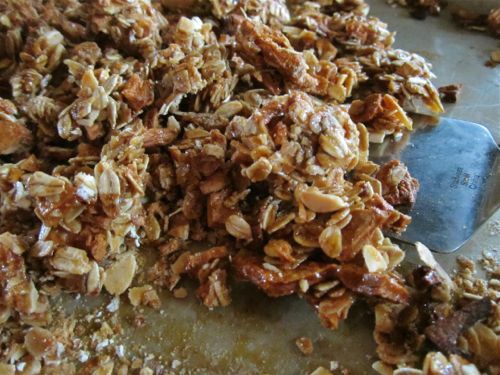 Watch towards the end of the cooking time to ensure the granola doesn’t start to burn from the caramel. Remove from the oven, give a quick stir, and let cool. 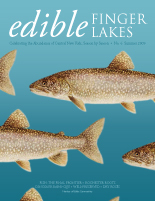 I love, love granola (maybe to a fault! ), so this recipe really caught my eye.